The story of "The Sorcerer's Apprentice" is a timeless one: an unassuming young man learns that he has special powers far beyond his imagination and reluctantly agrees to be mentored by a master of the magical arts. Imagine "Star Wars" in New York City. Dave Stutler (Jay Baruchel) is a physics prodigy at New York University who one day meets Balthazar Blake (Nic Cage), who tries to convince the young man he's a direct descendant of Merlin. Blake, it seems, needs Dave's help battling another sorcerer, Maxim Horvath (Alfred Molina), to prevent armageddon. The effects -- and honestly, the effects are you'd watch -- are often, top-notch. The shimmering confetti falling on Chinatown as a great dragon tries to kill Cage and Baruchel looks magnificent, as does the dragon itself. The car chase through Times Square, featuring the old Hungarian Mirror Trap, is nicely executed as well. Where director John Turteltaub's vision fails, unfortunately, is at two key junctures in the film: during the recreation of the iconic "marching mops gone haywire" scene from "Fantasia" and during the battle in Battery Park at the end of the film. The "Fantasia" scene in "Sorcerer's" lacks both the highs and lows of the Disney original, and is shorter by half. With the compressed time and emotional range, the arc suffers greatly -- you don't get to fully feel the triumph or defeat. And where Mickey's dark, dank dungeon manages to be bright and richly colored, Dave's looks gray-washed. Why you would subject yourself to inevitable comparisons to one of the most loved moments in film history is anyone's guess. Watching the climactic scene with Horvath and his dark mistress Morgana poised to raise an army of zombies to overrun the world, the power beams from their spells bouncing across the New York City skyline, one is struck by a sense of deja vu. And then it hits you -- they're conjuring up the Stay Puft Marshmallow Man! They're not, of course, but it's hard to ignore the echo. But these missteps are hardly the film's biggest problems. Nic Cage's performance, such as it is, will you have you on the brink of a narcoleptic coma. His line delivery is flat, he rarely emotes and just generally doesn't seem invested in the goings-on, satisfied to let his cape and a ridiculous hat do all the heavy lifting. 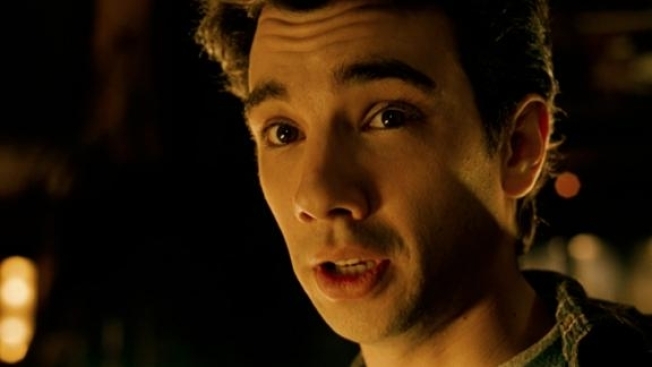 Baruchel does more with one eyebrow than Cage does with his whole being. Molina is -- once again -- a fantastic villain, bringing the sense of relish and gee that one wants from a sorcerer -- especially an evil one. He glowers, sneers, rages and rolls his eyes at every turn without ever going over the top. It's nice to see Baruchel finally getting the attention he deserves, though one fears that he night get stuck in his own one-man movie ghetto as the "'Aw shucks,' just below average guy." With his spindly frame, huge eyes, rhino-thick hair and a brow that can't sit still, the role comes easily to him. The relationship between Dave and Becky (Teresa Palmer) is the very definition of perfunctory. The sparks between them are generated almost entirely by the Tesla coils he keeps in his laboratory. Becky never really gets to do anything other than be the object of Dave's affection. The one time she springs to action, it's almost entirely off-screen, after which she reappears out of breath but triumphant. Dave's pursuit of Becky repeatedly grinds the film -- to say nothing of Balthazar's plans -- to a halt. "The Sorcerer's Apprentice" falls well short of reaching its potential, considering the ingredients at its disposal. If only Nic Cage had tried a little harder and Turteltaub a little less so.